Let's start the week off with a statement, shall we? Although I typically steer away from wearing more than one statement piece in the same outfit, this time I couldn't help myself... YOLO! Is YOLO still even a thing?? I was so mesmerized with the laser cut pattern on this shirt from Sheinside because it makes the top unique and a statement piece. 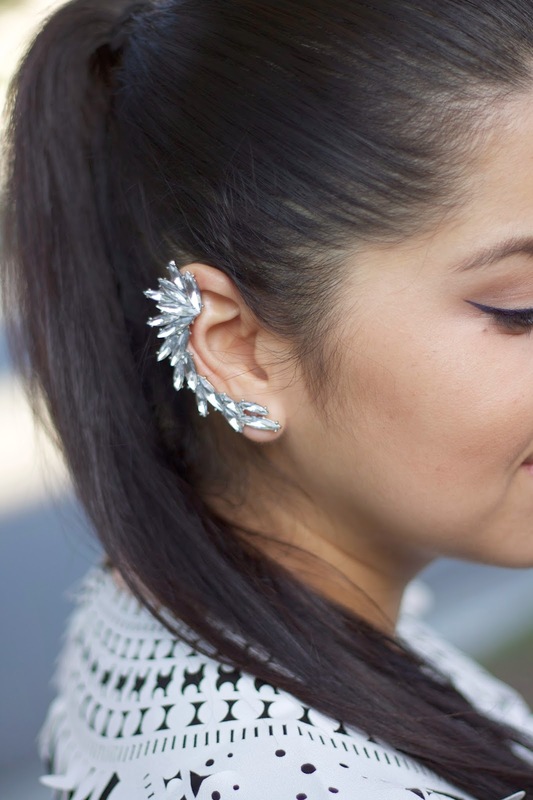 Since I wanted to wear a high pony to show the details of the top, I decided to jazz up the 'do with this sparkly ear cuff from B2C which did just the trick. I anticipate that these pieces will be making more statements in my wardrobe in the near future! Great outfit!! Reminds me of something Kim K would wear but in a good way haha. Really lovely classic look and I def. agree with Danika about the Kim K vibe. You are rocking that earcuff and I am so loving your outfit as well. Stunning. That top is so fun!!! I love this look on you! So classic, but with some fun! Love this black and white look! The details on your top are just amazing! omg! that top is beautiful and unique (two things I love! ), and you look stunning in it! I've been wanting to buy from that store but I'm not sure about the sizes and quality. I'm almost 5' 3" and 145lbs ..are their sizes accurate?. Thank you :) ! I love the shirt, it's ornate yet so sophisticated.